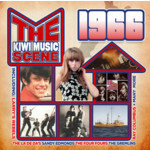 An ephemera laden 24 page, 32 track time capsule celebrating the exciting Kiwi Music Scene in 1966. There were approximately 170 local singles released during 1966. The bulk of the releases came from a handful of independent labels. Also included are 5vie unreleased tracks and many others on CD for the first time along side dee jay patter from the incorrigible Keith Richardson from 2ZC in Napier.